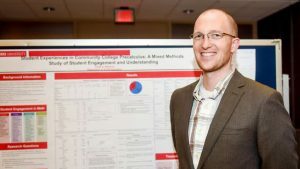 Derek Williams ’17 PHD will expand his impact on others through teaching mathematics at the college level and in a teacher education program. What’s Next: Pursuing a tenure-track assistant professor position at a university. I wanted to pursue a Ph.D. in mathematics education, which will allow me to expand my influence on the teaching and learning of mathematics. Education will allow me to continue to teach mathematics and expand my sphere of influence on mathematics education through working in teacher education programs. Learning is powerful. Education open up opportunities and give individuals confidence to realize that they are capable of success, learning and working hard to achieve their goals. I have been able to serve as the university supervisor for many of the mathematics education undergraduates during their semester of student teaching. This experience has been highly rewarding, and it is uplifting and exciting to see undergraduate students transition from students to professional mathematics teachers. I love working with student teachers! A supportive, diverse, collaborative and collegial environment is important to the success of individuals and to the field (of mathematics education). I have never been involved with such supportive and inspiring faculty and peers as I have at NC State, and I will try to create a similar environment in my future position and classrooms.